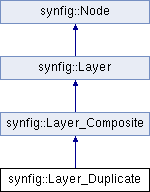 References synfig::Layer::connect_dynamic_param(), synfig::Layer::create(), SET_INTERPOLATION_DEFAULTS, and SET_STATIC_DEFAULTS. References synfig::Color::blend(), synfig::Layer_Composite::get_amount(), synfig::Layer_Composite::get_blend_method(), synfig::Context::get_color(), get_duplicate_param(), and synfig::IndependentContext::set_time(). Referenced by accelerated_cairorender(), accelerated_render(), and get_color(). References synfig::Context::accelerated_render(), synfig::Color::BLEND_COMPOSITE, synfig::Surface::blit_to(), synfig::Surface::clear(), synfig::Layer_Composite::get_amount(), synfig::Layer_Composite::get_blend_method(), get_duplicate_param(), synfig::RendDesc::get_h(), synfig::RendDesc::get_w(), RENDER_TRANSFORMED_IF_NEED, synfig::Surface::alpha_pen::set_blend_method(), and synfig::IndependentContext::set_time(). References synfig::Context::accelerated_cairorender(), synfig::Color::BLEND_COMPOSITE, cairo_paint_with_alpha_operator(), synfig::Layer_Composite::get_amount(), synfig::Layer_Composite::get_blend_method(), get_duplicate_param(), and synfig::IndependentContext::set_time().